Sixty-eight million pounds and DEAD! Someone had once told Detective Inspector Keith Tremayne that some people were lucky and some werenâ€™t. 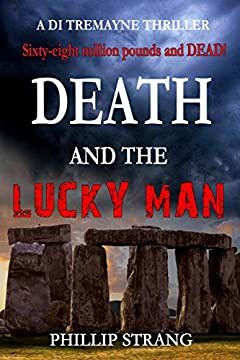 Tremayne knew only one thing: the man lying dead in a pool of blood had qualified on the lucky after winning sixty-eight million pounds on a lottery ticket, but now his luck had run out. Tremayne knew the victim, Alan Winters; even knew his family. The man with all his new wealth had not hidden behind closed doors, fending off the scrounging relatives, the newly-found friends. That wasnâ€™t Wintersâ€™ style. He had been out and about, driving expensive cars, living well. And now he was dead. Tremayne knew the questions would start to roll. And why was he lying on the Altar Stone at Stonehenge, naked, with his throat cut? Clare Yarwood, his sergeant, had seen the body as well, turned away initially at the sight of it, but had taken a deep breath and stood alongside Tremayne. â€˜Nasty one, guv,â€™ she said.